It is that joyous time of year… girl scout cookie time!Have you stocked up on your favorites yet? 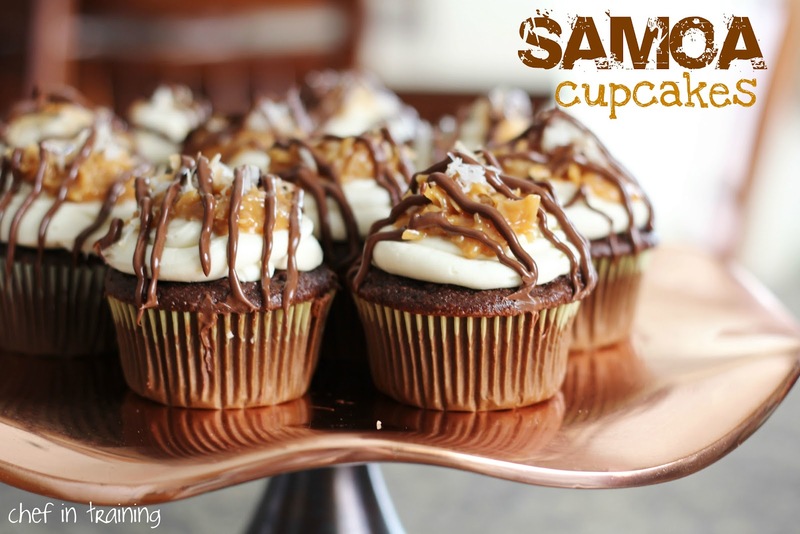 !Samoa cookies might be my favorite of the bunch, so I decided to take a spin on it and turn the idea of the fabulous cookie into a fabulous cupcake! These were SO dang good! In a saucepan, stir together granulated sugar and water. Bring to a boil over medium high heat. Cook without stirring until mixture turns a deep amber color, about 10 minutes. Remove from heat and slowly add in cream and vanilla, stirring until very smooth. Let caramel cool for about 20 minutes, until it is just barely warm and still pourable. Alternatively, you could use just under 1/2 cup of your favorite caramel sauce. In a mixer fitted with paddle attachment, beat butter and salt together until lightened and fluffy. Reduce speed to low and add powdered sugar. Mix until thoroughly combined.Scrape down the side of the bowl and add the caramel. Beat on medium high speed until light and airy, and completely mixed (about 2 minutes). Mixture should be ready to use without refrigeration. 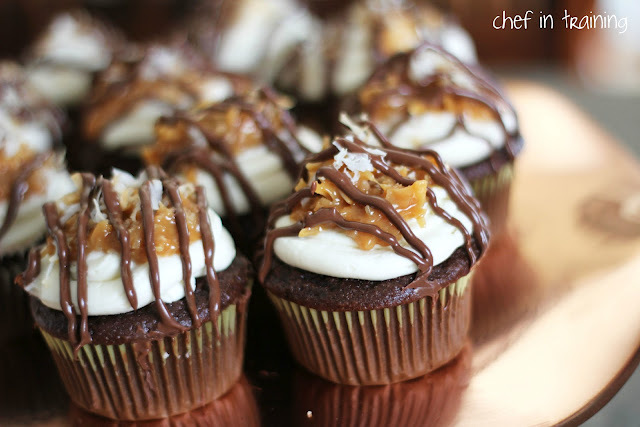 If your caramel was too hot when added, it will cause your icing to be runny. If this happens refrigerate for 15-20 minutes. Once cupcakes have cooled, frost onto cupcakes. Place coconut on a baking sheet and bake at 350 degrees F for 5-7 minutes. Melt Caramels and milk together in microwave in 30 second increments, stirring in between until it has reached a smooth melted consistency. Stir 1/2 cup of toasted coconut.Place the caramel-coconut mixture into a ziplock bag and seal. Snip off one of the bottom corners of the bag and squeeze a little onto the tops of each frosted cupcake. Take the remaining 1/2 toasted coconut and put a little on top of each cupcake. Melt chocolate and oil in microwave for 30 second increments or until it has reached a smooth melted consistency.Pour into a ziplock bag and seal. Cut a tiny snip off one of the bottom corners and drizzle onto cupcakes. Theese are so pretty! I made Samoa bars a while back, they are so awesome! :) Yours look amazing! These look and sound so amazing! Love the extra coconut--my favorite part of the cookie--and the caramel buttercream. O.M.G. What a great looking cupcake!!! Yum!!! These look incredible, can't wait to try them! A friend of mine made these are they are delicious!! These look so yummy! Beautifully decorated too! Do u have to use coconut? My husband hates coconut so is there something else u can use in replace of that?